The ultimate eye makeup essential, this deluxe dual-ended precision pencil with companion brush perfectly shapes, shades and defines brows for a beautifully natural look. The velvety smooth formula enriched with Coconut Oil glides on effortlessly for gorgeously groomed brows. Slips conveniently into any makeup bag for touch ups on-the-go. 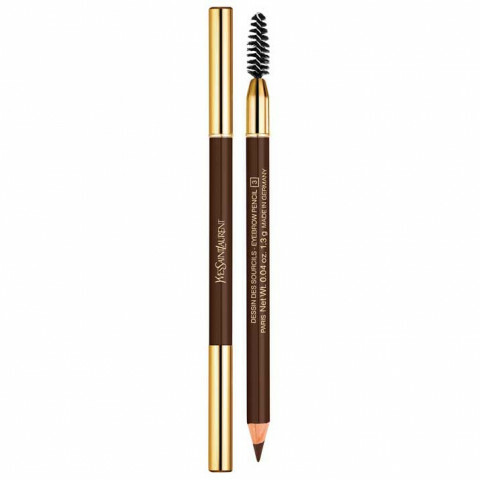 This pencil is one of the best eye brow pencils that I have used, very soft and pigmented. The brush is not like other brands, this is very soft and feels good when brushing. Good for people who has no much skills doing their brows. Definitely recommend. use this daily, lovely pigment and lasts through the day super well. I like how small the pencil is and that the colors mimic natural brow colors. nice eyebrow pencil. easy to use and gives a natural finish to the brows. lasts all day without smearing. fills in the brows well, super pigmented and creamy formula that applies smooth. This eye pencil is easy to use. I create dimension my using small brush strokes in the direction of the hairs of my brows. I like using this in addition with the brow gel to make them look extra full or to adjust the color.